Sikkim is a former independent country that has been part of the Republic of India since 1975. Besides the Indian state of West Bengal to the south, it borders Bhutan to the east, China to the north and Nepal to the west. Distinctly mountainous (it shares the world's third highest mountain peak with Nepal), situated on the south flank of the Himalaya, it's not surprising to find that it contains a number of hot springs. Sikkim - A Travellers Guide by Arundhati Ray gives a short intro to hot springs in Sikkim ("very good for health") and has a couple of photo's which give us some insight into soaking couture (see page 38 / 39). Two other references I found list nine hot springs in Sikkim, though what follows are a few more. Possibly some duplication or some unlisted, who knows? 'Lot of barebodied men of all ages skin dipping in a pool of water. The water is rather warm than hot. An appearance analogous to a fish market, where a large number of live fishes are kept in a barrel for sale. This, in essence was my first impression of the Tatopani hot spring site [Legship]'. Legship in South Sikkim could well be the name of the first of a number of hot springs in Sikkim. Alternatively it's known as Reshi hot spring or Phur Tsachu, there's no consensus on the right name. Legship itself is becoming more well known as it hosts a Shiva temple and is the site of a hydropower station. 'Situated on the bank of River Rangeet is the hot spring 'Phur Tsa Chu', half an hour drive from Legship and one hour drive from Jorethang. Pilgrims from all walks of life come to dip in this hot spring during the month of January to March'. 'Ideal spot for bird watching and butterflies. At 8 kms from Legship and 34 km from Ravangla towards Naya Bazaar on the banks of river Rangit, lies the popular hot sulphur springs. It's great medicinal values as well as religious importance attract many tourists and local devotees. The place is also important for two sacred caves Khandosangphu and Sharchog Begphu, where the great Buddhist Saint Padmashambhava is believed to have meditated during His journey to Tibet in 7th century'. 'It flaunts of a hot spring nearby, believed to hold medicinal powers, and footprint inscribed rocks which are attributed to that of the fairies. Lho [cave] Khandro- Sang Phug is said to be associated with the ‘God of Increasing Knowledge’'. 'Hot Spring Legship West Sikkim'. There is though one official website, complete with GPS coordinates. One must also note that there's quite some confusion concerning what / where. This link to a publication revels GPS coordinates of reshi, Borong and Polo hot spring . 'From Kechopari we took a jeep to Legship where there were "hot springs". After a long hike we discovered that these hot springs were a tiny dribble of water by a monestary along the Rangit river. Our dreams of swimming in warm water were dashed. Plus, i had been feeling a bit under the weather already and the smell of sulfer did me in. I spent most of Legship asleep in bed. Sweet sweet hotsprings'. 'In Legship however things were not so wonderful. There were no rooms at the one hotel that was open. No problem, I could walk to the hot springs where there were huts. I asked around. The consensus, the hot springs don't get hot until DECEMBER. Dear Lonely Planet editiors, this might be something you want to include in your next edition'. 'From Tashiding we went to Legship, a nowhere transit town, but we had a picturesque walk along the river to find the local natural hot springs. Compared to NZ, the hot springs are lukewarm and very shallow. But it was a cultural experience to be pressed firmly between 30 partially-naked, old, local women, and pampered with a mud treatment and constant scoops of hot water over parts of my body freezingly exposed by the shallow water'. 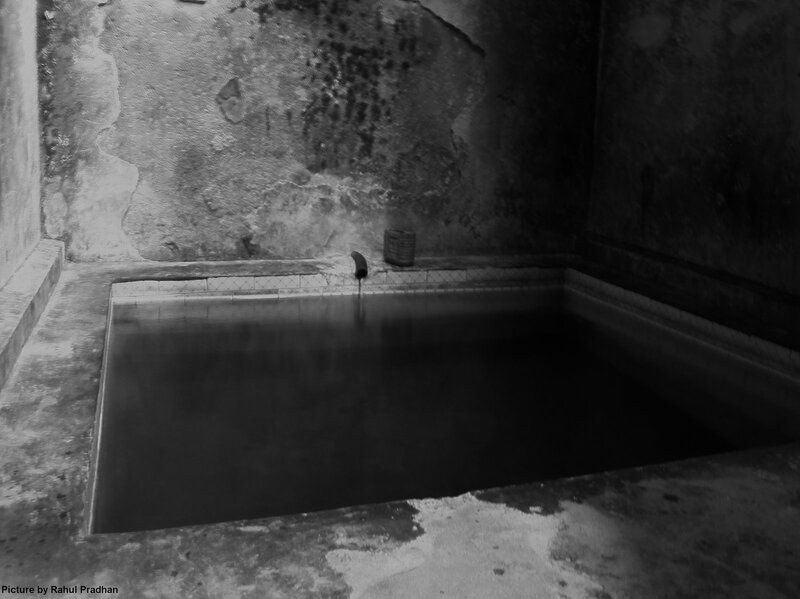 'The Scorpio again came to halt at the Reshi Hot Springs (also know as Taatopaani in the local lingo). Well but before we could get to see the springs, we had to walk down some real steep steps, cross a creaky suspension bridge & then walk through another narrow path all the way to the banks of the Legship lake. Well once we reached the springs, we saw this small encircled area separated from the lake; that my friends, was were the water was hot. There were plenty a people who were relaxing in the hot waters of Reshi; more were just flowing in getting out of their clothes in a whim; taking a dip. My personal thoughts were that though the area was pretty, it could be a tad better maintained'. 'Firstly there is a near vertiginous climb down a narrow flight of steps. Then we had to cross a worn out suspension bridge over the crystal clear river water. Walk for about 200 metres to reach the spot of hot springs. It is a very small pool of water just above the main flow of the river. Hot water overflows from this pool into the river. It was so full of people that we lost the interest of dipping in it'. 'It just takes a one hour ride to reach Legship form Jorethang , which is famous for its hot water spring [Tatopani]. On the way to Legship, one can see a board put up wherein it is written Tatopani Bhir. Just on the bank o the river Teesta, there is a 20 x 20 square foot hot water spring. The water is bounded with two steep hills [Bhir], Sanghanath and Miyong hills. The Legship hot water spring is known for its medicinal proprieties for healing different ailments like chronic skin disease, bronchitis and hearing ailments. The hot water spring is also worshipped by the people and there is a mythical belief that if people with any desire for something here then that is definitely fulfilled, so people come here to fulfill their long pending wishes from far off places like Nepal, Bhutan and the neighbourings states like Assam, Nagaland, Bihar. The pilgrims generally come to the hot water spring in the month of April to November, every yea. More than six thousand people throng here which then turns into a mela. Most of the pilgrims stay at the hot water spring for about a week. The people are allowed to take a bath in tow batches of males and females at a time. Every group is allowed to have a bath for two hours. The Chowkidars [overseeers] that have been appointed by the Tourism Department see to that every thing goes according to order and in time. The department has also built one resting shed with attached bathroom for the pilgrims. The department is also building eco-huts, which is under construction. The eco-huts will provide makeshift lodges for the pilgrims, during their stay at the hot water spring. The six months during which the pilgrims come to the hot water spring gives the local villagers a chance to earn some money by doing various business, along with giving the village the feeling of holding a ‘village fair’'. Source: The Mail, dated: 10th September 2007. Furthermore there is one youtube vid. The above is probably the most well-known of Sikkim's soak. Less well-known are what follows. Situated close to both the Tibetan and Bhutanese borders it is often referred to by the Bhutanese name for hot springs (tsachu) which is mentioned after the location. In this case Yumthang Tsachu. Besides it being the location of a hot spring, Yumthang (and the valley in where it is located) is known as the 'enchanted valley of flowers', the flowers sprouting from the alpine meadows and extensive rhododendron forests. The fame of the former is such that the government organized the International Rhododendron Festival 2010 here. 'For the convenience of bathers, there is a hut with two pools which contains hot spring water. Hot water rich in sulphuretted hydrogen gas from a spring just behind the hut and is diverted to the pools' (source). P2061024 Hot water spring, aka "Taato Paani" in Yumthang. First hand reports often are tepid in their appreciation, others seem more honest as you might agree with after a look at the picture above. Haha indeed. Welcome to Asia. Sikkim Times (9 October 2009) adds that the facilities will be improved. 'An hour further north and we got to Zero Point, the end of the road, with the hot springs renowned for their medical properties. There are some families that come to hot springs every year for about 2-4 weeks. They sit down in the hot water few times a day, cook and mostly sleep and relax in a hut. They believe that this is the best cure not only to have a beautiful skin but also for any physical problem. They were so hospitable. They made tea for us that warmed our cold body (some people from our group jumped into the hot pool but next day, all of them had a cold:)'. Yumesamdong (or Momay Samdong) is located just up the valley from Yumthang (25 km). There are reputed to be more than 10 hot springs closeby. Others say 14! As it's pretty remote and rugged (snow more or less year round), not much is known about the springs in this area. One can get a first hand report of a trip to Yume Samdong. Beware though, in 2009 tourists died when a rock smashed their car, the Sikkim Times reports. The photo is from a short blog entry by helena and jakob while visiting Yumesandong. They also have a reference to Rinjink hot spring, not substantiated anywhere else. Ralang hot spring is, you might have noticed, above often referred to as Ralong, but it seems Ralang is the most often used. Ralang, like Borong, is apparently very beautiful and Ralang is also home to a Buddhist monastery. The hot spring played an important part in Sikkim's history when in the 18th century the Sikkim ruler was murdered here. 'then set off for a nearby hot spring, that I understood to be 1-2 km away. ... It wasn't... I'm not quite sure how I got this so wrong, but I'd estimate in the end I walked about 10 miles up and down a very steep hill, having neglected to take any water with me. ... The hot spring was a small pool containing water that was quite hot, however by this point hot; undrinkable water was not really the sort I was after. So after a brief rest we [Adrian and a dog] set off back up the hill, which really was very steep'. 'Eventually the jeep came to a stop and when we asked where the hot springs where they told us that they were closed because it was low season... it was incredible how not one person gave us this important piece of information... we would have really taken it into consideration'. 'This hot spring is popular among visitors as it is believed to have strong curative powers and hundreds of visitors come every year to take a dip in it'. 'A little beyond the hut [which is Tarum] after crossing the stream there are two hot springs where one can have a relaxing dip. The one on top is being the hotter of the two is considered as the male and the lower one as the female. As per tradition one must always enter the female pond on the top before entering the male one'. 'All of a sudden we reach into an opening from where we can see a small house, our residence for the night. It’s a small basic structure with two rooms, a kitchen and a bathroom, as one room is already occupied by two elderly Lepchas [local ethnicity] we make ourselves comfortable in the adjoining one. We take appreciative gulps of piping hot tea to warm our damp bodies. Very quickly we strip ourselves of our wet clothes to immerse our bodies in the female pond. Male and female, that’s the term the locals have given to the two sulphur ponds, the cooler one being the female and the hotter one the male. The locals believe that one should first enter into the female pond before going to the male pond, the reason for which I really did not know but logically it made sense as the male pond was so hot that it made me yelp as I dip my foot in. Nima and myself were thoroughly enjoying as we sit there chatting for more than an hour, coming out occasionally to escape the dizziness from the sulphur fumes'. The following photo ('male pond') is also from this blog. Looks great. 'The walk through overgrown trails in the hot morning makes it hard to enjoy the hot spring in Tsarum at first. But after a rinse in the cold creek, it feels wonderful to sit under the pipes with hot water. Unlike other hot springs, this one is kept very clean, is visited by few people and the water doesn't even smell bad. It's definitely one of the top-3 hot springs in the Himalayas'. Possibly unknown but only to geological insiders [PDF] are Zee hot spring and Shagyong, both in northern Sikkim. Another mentioned in the same document is Gangyap in Western Sikkim. Sometimes referenced as (possibly?) Tashiding, there are a few links. 'Dzongu contains a number of important sacred sites such as caves where Guru Rinpoche meditated, the Keshong Lake, the Kongsa hot springs, and the Tholung temple that is revered not merely by the Lepchas, but by all the Buddhists of Sikkim'. Could it be just another name for Tarum? No (? ), it is the same as Tholung Tsachu which is another hot spring along a trekking route, though less well known. 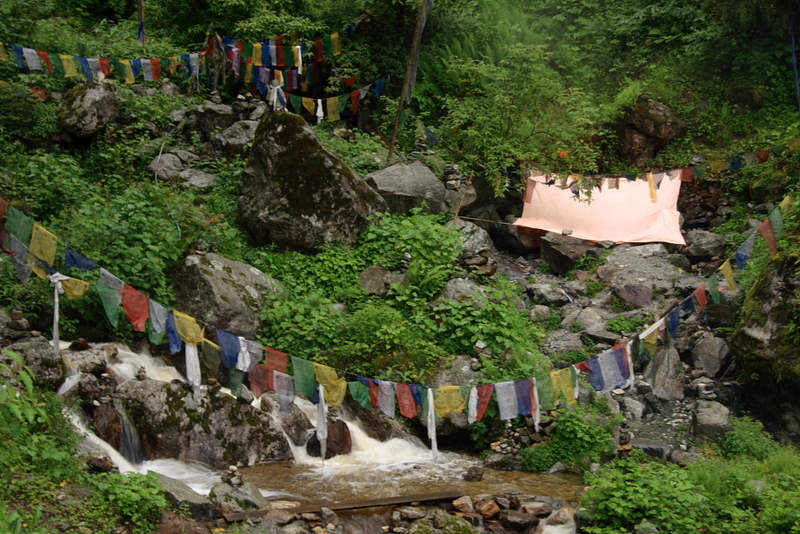 Tholung is located in northern Sikkim and is home to a Tibetan monastery as well as the nearby hot springs. 'Enjoy the serenity of the place and spend some time meditating. A traditional bamboo bridge from here takes you to a hot water spring. Spend some time soothing your tired limbs here'. But it could also be referred to as Dzongu, as Dzongu primarily refers to the wider valley of such ... though the hot springs would be close to Tholung monastry. 'Lingdem Hot Spring: Near Kayeem-Lingdem, there is a hot spring with separate enclosures for males/ females. You can soak in the bubbling Sulphur water at a leisure'. 'In what could be a repeat of 1949, the Himagiri Power Project staff discovered hot-spring at the site where they were drilling rock, about 150 ft above Lingdem Road on September 10. .
Talking to media persons Zilla member of the area, Dubzor Lepcha and the local people informed that the same hot spring was discovered at the same place in the year 1949 but suddenly submerged after two years. “This year, this hot spring has suddenly emerged with drilling works being carried out at the same place,” they said'. 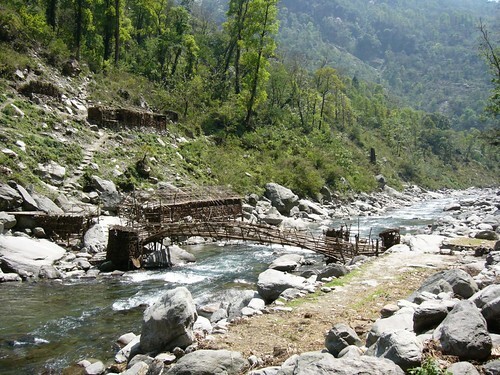 '... for development of Allied facilities for Lingdem Hot Spring, Upper Dzongu, North Sikkim'. So what is now Lingdem hot spring? 'After about 2 hours drive we reached the place called Khandum Tshachu, which literally means Hot spring water of Goddesses. We all dropped by the nearby hot spring and just took a little patched washed as we did not have time to halt for the whole day'. 'The increase in human activities in the hot spring areas has lead to various ecological stresses. The people demand on the surrounding forests for firewood due to lack of alternative fuel. There is a lack of proper solid waste disposal as huge quantities of solid wastes are generated during peak season. Waste materials lie scattered along the surrounding huts and the river banks. The sanitary facilities available are unhygienic and insufficient as temporary toilets are constructed on the river bank where the faecal matter is directly discharged into the river without any treatment. The demand for meat and meat products had further accelerated the rate of fishing in the rivers. The large number of patients with various communicable diseases frequenting this hot spring may further spread these diseases. 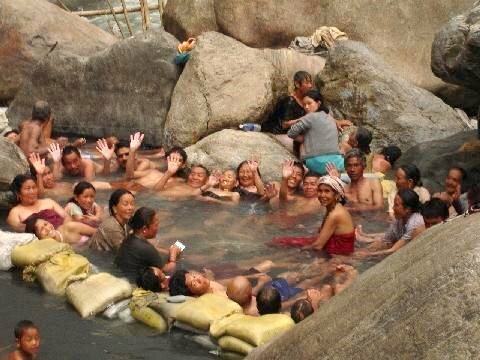 It is feared that due to the unhygienic conditions prevailing around these hot springs, the people on their way back may be infected by new diseases. The hot springs of Sikkim are regarded as places of worship and hold a high religious esteem in the hearts of the local people. The people drink the hot water and bathe in it, considering these factors detailed microbiological and radio-activity study of these water is felt essential taking into account, the study of the geomorphologic aspect of these hot springs and their economic exploitation'. Thakur,N, S. Das, M.T. Sherpa, R. Ranjan (2013) GPS Mapping and Physical description of Polok, Borong and Reshi Tatopani - Hot springs of Sikkim. Journal of International Academic Research for Multidisciplinary, Impact Factor 1.393, ISSN: 2320-5083, Volume 1, Issue 10, November 2013.